Exchange server versiyonlarının yazılımsal olarak support matrixlerini aşağıdaki tablolarda görebilirsiniz. 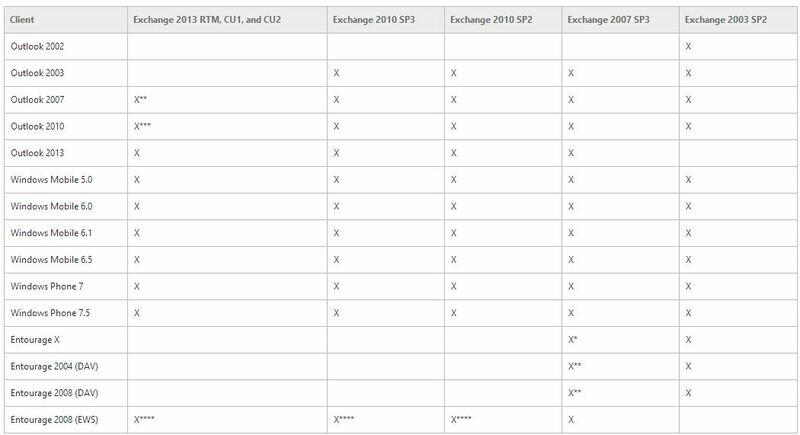 Support is added by Exchange 2010 SP2 RU5. **Requires the hotfix described in Microsoft Knowledge Base article 963664, Error message when you click the flag icon of a message in the message list view in Outlook Web Access 2003 when you are using Internet Explorer 8: “‘firstchild.firstchild’ is null or not an object”. ***Requires the hotfix described in Microsoft Knowledge Base article 911829, You receive an error message when you try to perform any editing tasks, or you must click to enable the compose frame in Outlook Web Access. **Requires Outlook 2007 Service Pack 3 and the November 2012 Public Update or later. ***Requires Outlook 2010 Service Pack 1 and the November 2012 Public Update or later. ****EWS only. 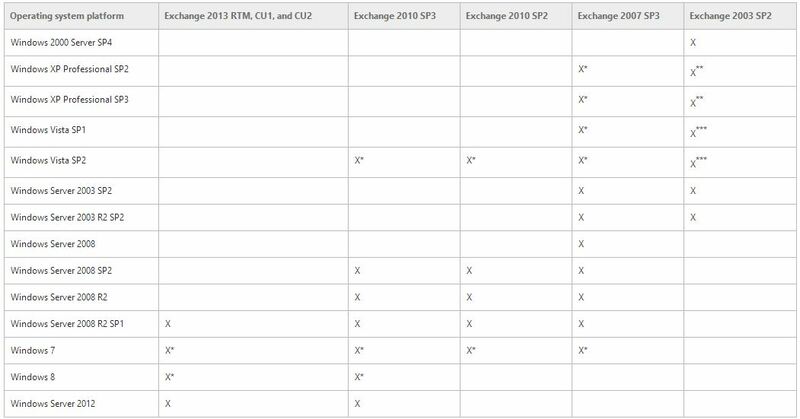 There is no DAV support for Exchange 2010.